In the Security & Compliance Center, several reports and insights are available to help your organization's security team mitigate and address threats to your organization. If you're a member of your organization's security team, you can manage schedules for one or more reports. Make sure that you have the necessary permissions assigned in the Office 365 Security & Compliance Center. 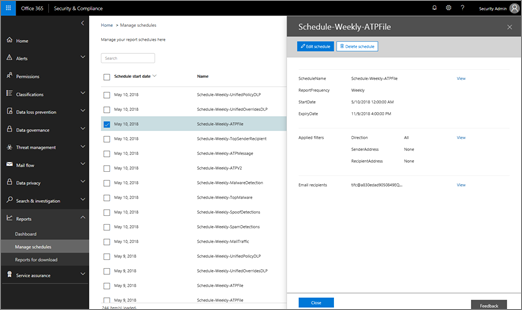 In general, Office 365 global administrators, security administrators, and security readers can access reports in the Security & Compliance Center. Go to https://protection.office.com and sign in. This takes you to the Security & Compliance Center. In the Security & Compliance Center, go to Reports > Manage schedules. Select an item in the list. Review the information for the report's schedule. As appropriate, edit or delete the schedule, and then click Close.